The Statistical Digest for Rural England published by DEFRA at the end of April this year highlights some interesting social and economic trends in rural areas. One trend in particular has caught our attention about the rate of house building starts and completions in rural areas compared to urban areas. The statistics show that from 2004 to 2012 the rate of housing starts per 10,000 population is greatest in the most rural areas of the country and lowest in the most urban areas. The same is true for housing completions. 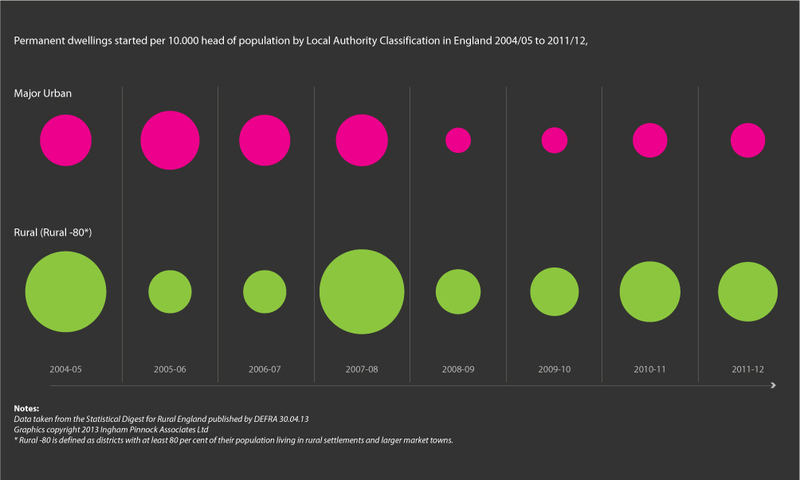 We know that the proportion of the UK population living in urban areas is on the increase. Indeed, since the 1950s there has been a worldwide increase in urban living, in the UK for example the population living in cities in 1950 was approximately 79% and by 2030 it is set to rise by over 13% to just over 92% (source: World Resources Institute). So given that the trend is for more urban living and it appears that a greater proportion of new dwellings are being completed in rural areas, there appears to be a mismatch between supply and demand. There are of course many possible reasons for this, but what are the impacts? How will this affect the composition of households and residential space standards in our towns and cities? Despite widespread fears of provincial NIMBYism, do housing markets in rural areas operate more efficiently than in more urban areas? And what impact will this have on residential land values and sales prices, particularly in towns and cities that are already highly inflated? The below infographic illustrates the difference between housing starts and completions in rural and urban areas.